Putting together gift baskets for men can be such a challenge, so we’ve created the ultimate resource with a huge list of gift basket ideas for him. 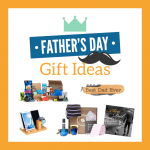 We’ve not only got a giant list of ideas for his themed gift but a set of punny and clever tags to pair with each of those Father’s Day gift baskets. 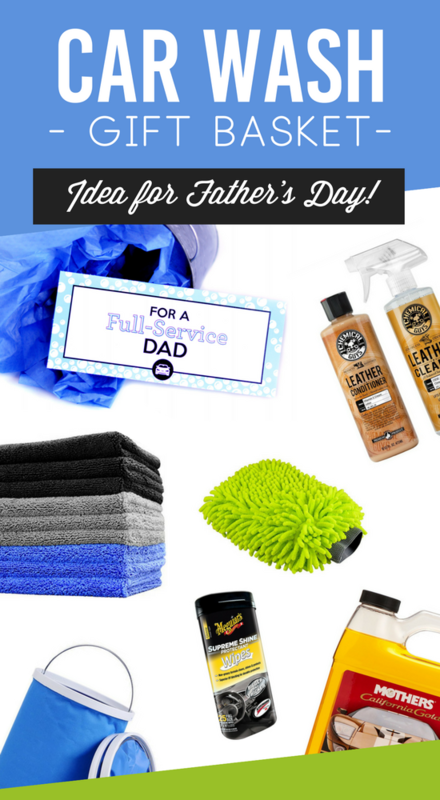 With all these brilliant ideas, you could probably have the next few years covered and give a different Father’s Day gift basket each year, because I’m going to bet you won’t be able to settle on just one of these thoughtful ideas. 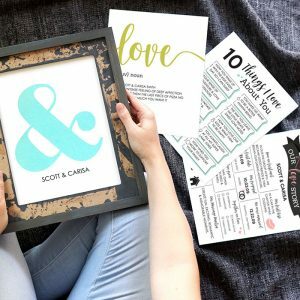 Carisa from Messes to Memories created some incredible tags to add to your DIY gift basket to make your gift look extra special and totally professional. You can create a homemade Father’s Day gift that’s thoughtful, meaningful and dedicated especially to him. The perfect gift basket for dads who love to camp, sit around the fire pit or just be outdoors with sweets and good conversation. Chocolate – A no-brainer in a s’mores-themed gift basket. Graham Crackers – Go with something high quality, these can make or break the dessert sandwich. Marshmallows – Step one in the s’mores ingredient list! Skewers – Well, you could just use sticks, but these are color-coded for fewer arguments. Dad’s gonna want that. Fire Starter – Great to have handy during wilderness adventures. Matches – Help him be prepared for any emergency situation. Lighter – Fun, and personalized way to get the fire going. Color Cones – For a more colorful s’mores experience. 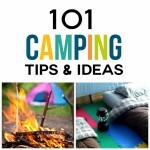 Use a Picnic Basket as a great place to store all his s’mores materials and for you to display his goodies. 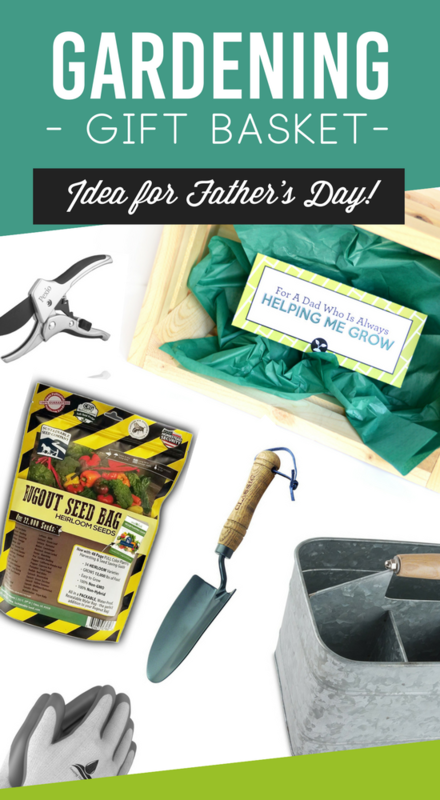 If your Dad loves to plant vegetable gardens or flower gardens, this is the best DIY gift idea for Father’s Day. 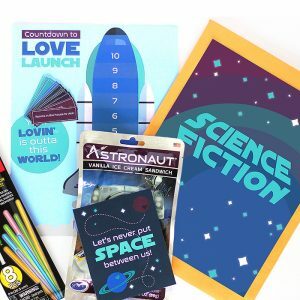 Seed Packets – This pack will have him all set! Gardening Gloves – Keep those hands at least a little cleaner. Trowel – We love the classic wooden handle on this one. Sunglasses – Not just for gardening, great any time he’s outside. Potting Soil – Help those give his plants a little boost with a high-quality soil to start them in. Spray Bottle – For misting those babies and making sure they get the perfect amount of water. Pruning Shears – Ideal for rose gardens, these’ll help him show off his gardening skills. Use a Galvanized Caddy or a Terracotta Pot for showing off his new gardening toys. 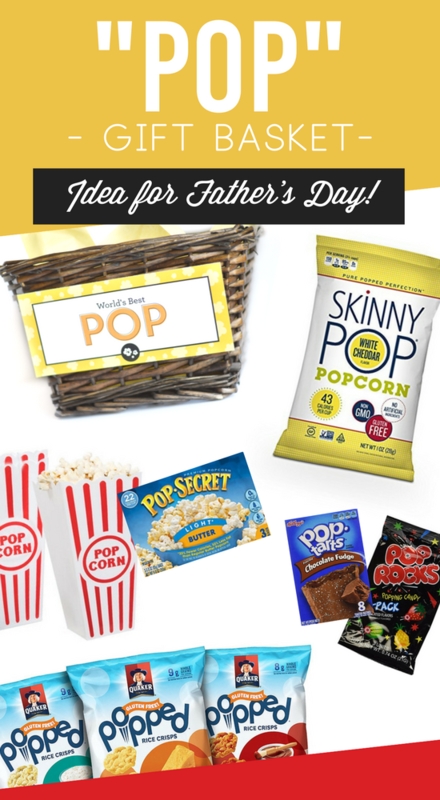 Remind Dad that he’s your favorite “Pop” or tell a grandfather you love him on Father’s Day! Popcorn – A bottle of kernels or the microwave kind. Skinny Pop – Delicious and at least a little on the healthy side. Popcorn Seasoning – Help him add some spice to his life. Soda Pop – Any flavor will do, but we think glass bottles would add a nice touch. Popcorn Socks – Fun and funny, perfect for a wacky sock day. Pop Rocks – For the kid in him—you know it’s in there. Pop Tarts – Quick breakfast that we all love, especially with all the great flavor options. Pops Cereal – Give him a giant family-sized box if you expect him to share. Poppable Candy – Anything little that he can pop right into his mouth! Popped Rice Cakes – Another healthier option for yummy snacking. Popcorn Containers – Let a movie night at home feel like something just a little more special. Use a Movie Theatre Popcorn Bucket and let all those treats POP right out! So many fathers would love to celebrate Father’s Day with a gift for the golf course. Golf Balls – Even if he’s good, he’s probably prone to losing a few every now and then. Tees – It never hurts to have extra tees lying around either. Towel – Those hot, summer months are coming, these will help. Gloves – Practical and necessary for the serious golfer, his hands and his score will thank you. Pencil/Scorecard Holder – Help him keep score in style! Club Covers – This is a great opportunity to think about what your dad really likes. 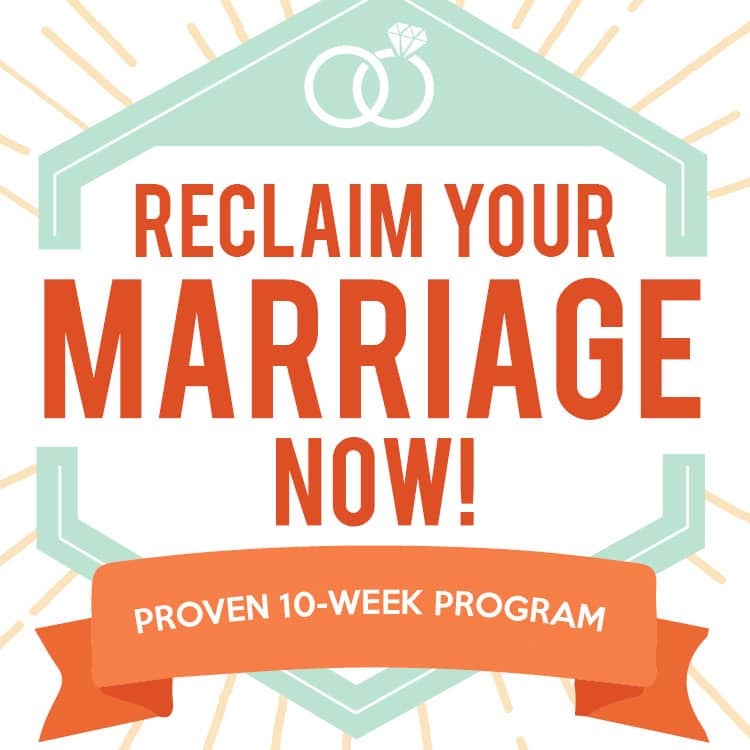 There are so many personalized options! Favorite Drink – Give him a pack of his favorite beverage to keep cool and hydrated on the course. 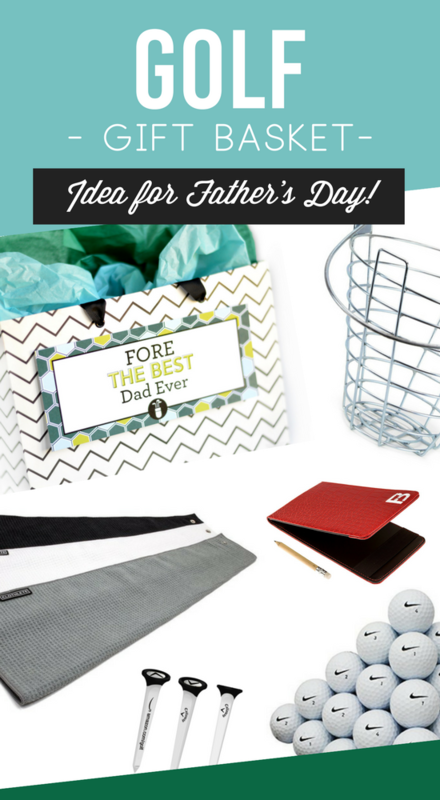 Use a Ball Basket as a clever and practical way to give your golfing gift to Dad. 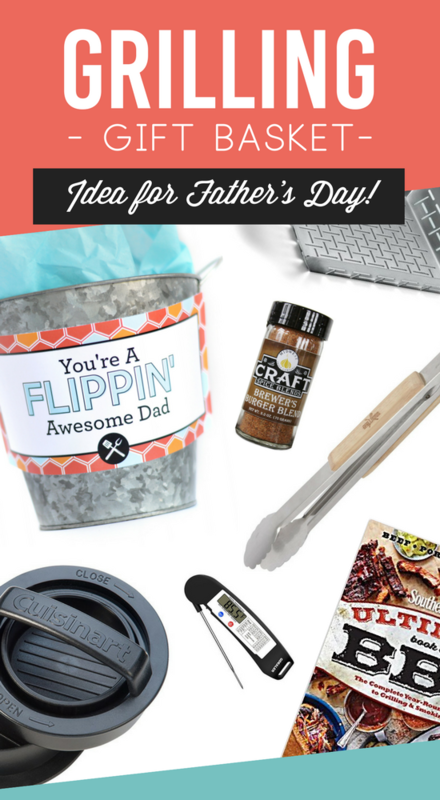 Dads who can’t wait to get out to the grill and barbecue for a summer dinner will flip for this Father’s Day gift basket. Spatula, Tongs, Grill Brush – Give him the right tools for the job. Oven Mitt – A serious BBQ-er needs to handle the meat with his hands. BBQ Sauce – He might have a classic, favorite but it’s always fun to try a new brand. Burger Spice Blend – Yummy! Make his next grilling session an absolute breeze with a pre-made spice blend. Knives – Sharps knives are a grill-master’s must-have. Burger Press – Burgers for a crowd made easy. Recipe Book – Not that he’d stop and ask for directions… err, ingredients, but just in case. Thermometer – For the perfectionist that knows the exact right temperature for doneness. Skewers – Kebabs are a healthy and fun way to grill. Apron – A cool way to add some extra fun to your gift basket. Aprons come in all styles, sizes, patterns, and have hilarious phrases! Use a Grill Basket to keep each of those grilling gifts in one special gift basket. The car lover in your family will certainly appreciate all the goodies to keep his car spotless. Soap – A basic, car wash essential. Sponges – Who knew there were fancy sponges?! If sponges can impress, these will do the trick. Wash Mitt – A favorite way to wash every nook and cranny of the car. Terry Cloths – Having a few nice towels around is absolutely necessary for a car enthusiast. Car Wipes – Ideal for quick, in-between cleanup. Rain-X – Increase visibility in the pouring rain – safety first! Tire Shine – SO much fun to apply because this stuff makes such a difference in just a few seconds. Air Fresheners – Make his car smell as clean as it is. Grit Guard – A clever invention to add to the bottom of the car wash bucket. Use a Bucket and add all the cleaning gifts inside to use later. 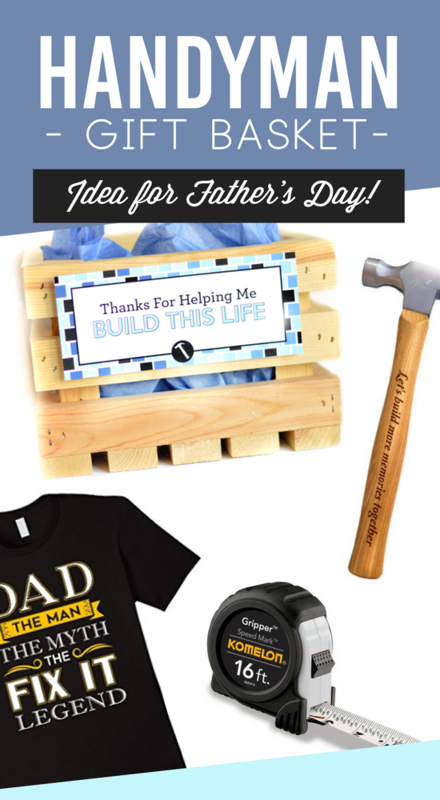 So many families rely on their Dad’s ‘fixing’ skills to keep the house in working order, so give him a few Father’s Day gifts to help make his job a bit easier (or at least a bit more fun)! Tools – You can never go wrong with a few more basic screwdrivers or another driver set. Tool Bucket ‘Cover’ – He’ll love this simple organization strategy! Mr. Fix It Shirt – Let him know that you know and appreciate how hard he works. Engraved Hammer – Sentimental and sweet, but still perfect for the guys’ guy. Magnetic Wristband for Screws – Because there’s basically nothing more frustrating than dropping a screw. Tape Measure – Ok, he already has one. There is no way he doesn’t lose it on a daily basis. More than one is always a good idea. Use a Bucket for setting up a household handyman’s dream gift basket. A simple, health-conscious snacking option that your Dad is sure to love this Father’s Day! Pistachios – Fun to crack and fun to eat! Spicy Almonds – Add a little extra heat and flavor to Father’s Day. Peanuts – The classic salty snack. 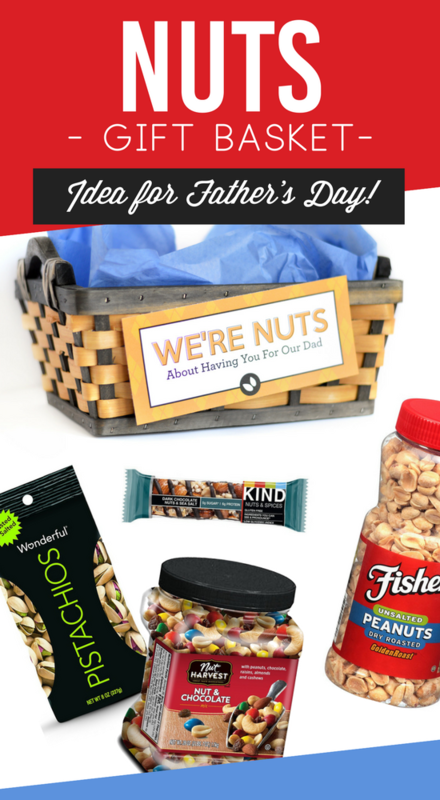 Mixed Nuts – For a Father’s Day gift with a little variety. Trail Mix – The perfect way to eat this treat is by the handful. Nut Bars – An easy (and delicious) on-the-go snack. Chocolate-Covered Nuts – Sweeten the deal by adding in some chocolate! Use a Wooden Crate to give your NUTTY dad a naturally gorgeous gift basket. Don’t all dads love breakfast foods?! Now you can treat him to breakfast in bed in gift basket form! Coffee or Tea – His morning drink of choice. Doughnuts – Don’t all dads have to love doughnuts? It’s just a matter of knowing his favorite. Muffins – Baked goodies galore! Coffee Mug – Just a daily AM reminder of how awesome it is to have him as Dad. Tide Pen – When he happens to spill mere seconds before leaving for work, he’ll be thanking you for adding this to the basket. 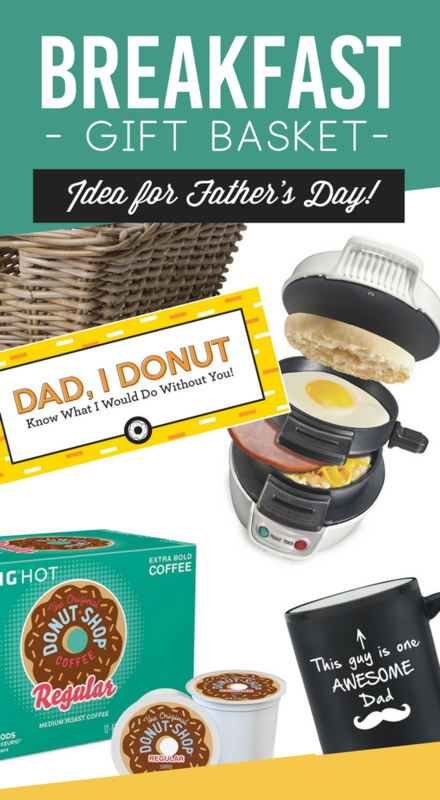 Breakfast Sandwich Maker – An easy way to make an egg for one special dad. Magazine or Newspaper – Something to relax and read at the start of his day. 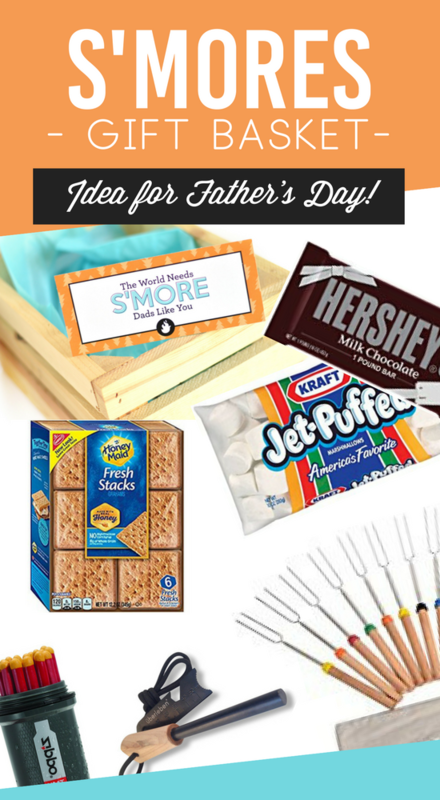 Use a Breakfast Tray to serve Dad his perfect Father’s Day gift basket! Is the dad in your life crazy about his facial hair? Help him keep it looking trim with a stash for his stache, plus a stash of snacks and treats, too! Snacks – Pick his favorite snack or grab a variety pack. Candy – Can someone even have a favorite candy bar?! Just grab a bunch! Cookies – These come close to homemade, but if you’re feeling ambitious, make some yourself! Beard Apron He might laugh. It might look funny. It does work. Beard Wax – Let him pamper his beard and feel really good about it. Grooming Kit – An awesome, travel-friendly set of grooming tools. Use a Galvanized Bucket to stash all his goods. 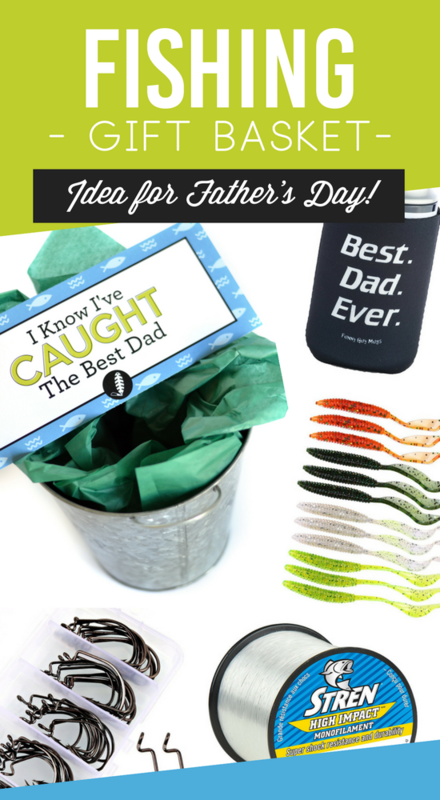 Encourage Dad to relax and unwind for Father’s Day with a gift basket filled with fishing supplies. Hooks – Can you ever have too many? Lures – Great to have lots of options, plus the creative side of me says it adds some pretty color to the basket! Bobs – Because what’s fishing without knowing where your line is?! Drink Cozy or Tumbler – When his hobby is to spend hours outdoors, he’s gonna want a cool drink. Fishing Line – It’s always good to have a bit of spare line. Fishing Bucket – There are just too many great ways to use a bucket. He’ll LOVE this one. Fishing Knife – A Fisherman’s necessity. Maybe keep this one away from the kiddos. Snacks – Just grab a few go-to favorites! Use a Tacklebox or Cooler that’s practical and clever. 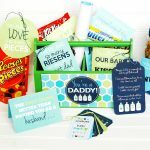 Whether he loves to watch baseball, football, soccer, or basketball, this gift basket idea is easy to customize with Dad’s favorite sport and team. Baseball or Football Display Case – If you’re feeling really grateful, add an autographed ball to that case–but if you’re strapped for cash, try adding a ball with a heartfelt message from YOU! Mini Basketball Hoop – Fun to play while watching the pros. Cracker Jacks – A simple, baseball-themed snack. Sunscreen – For the days he ventures out to a game in person. Slim Jims – A manly snack, perfect for grab-and-go. Pennant – Give him some team paraphernalia to support them all the time. Team Jersey – Bonus points if you know his favorite player and snag that specific one. Game Tickets – They might be a pricey addition but he’d certainly love it. Sports Bar Gift Certificate – If he can’t actually be at the game, watching it with a bunch of other fans has got to be the next best thing. Use his favorite team’s Hat or Helmet turned upside-down and pile the sporty gifts inside. 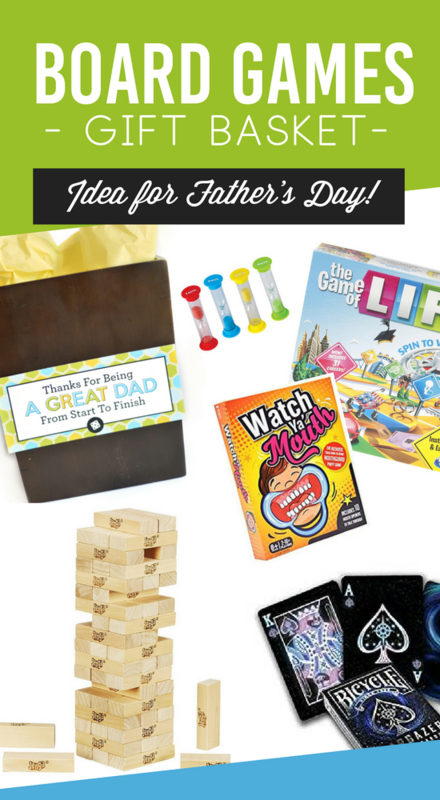 It doesn’t matter where your dad loves to game: family game night, poker night, or on group dates, fill up a gift basket with game accessories and Diva favorite board games and he’ll be playing for days! Timers – We love that there are different time periods, you could make old games even more fun by changing the timing. Game Pawns – Doesn’t it always seem like these are missing from your games?! Playing Cards – An extra-nice set is great to have around. Card Game Rules – Just in case anyone needs a quick refresher. Code Names – One of the best group games, he’ll love playing it with family or friends. Watch Ya’ Mouth – It just doesn’t get any funnier. Jenga – A classic game and a nice-looking addition to a gift basket for men. The Game of Life – Perfect for playing with family and pretty apt for this gift basket. Use a Storage Box so he already has a handy place to keep everything. 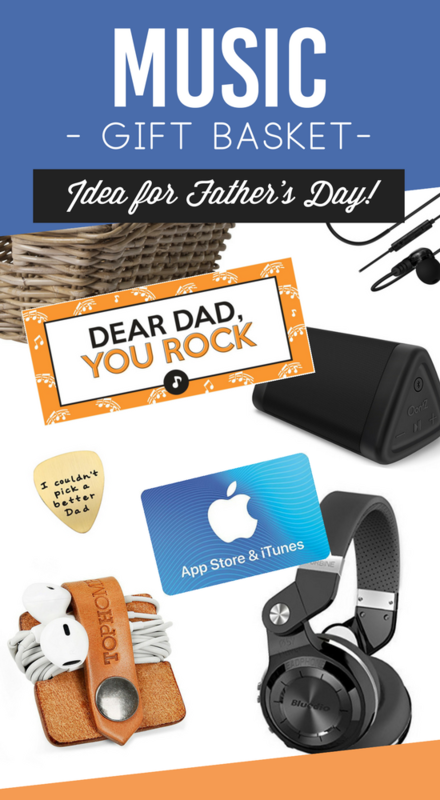 Let Dad belt out the high notes with a few music-themed gift ideas to remind him how loved he is on Father’s Day. Headphones – A high-quality and nice looking set that is wireless. Ear Buds – Something about these tiny things makes them easy to lose and easier to break. An extra set is must and these are even noise-canceling. Ear Bud Cord Organizer – Simple leather makes this practical and stylish. iTunes Gift Card – Let him pick his favorites or try something new. Portable Speaker – A brilliant way to listen to music anywhere. This bluetooth speaker is even splashproof. Custom Guitar Pick – Sentimental and sweet, with a message just for him. Karaoke Microphone – Here’s a fun gift that will surely involve the whole family in no time. PS This would be so much fun to use on a Karaoke Date! 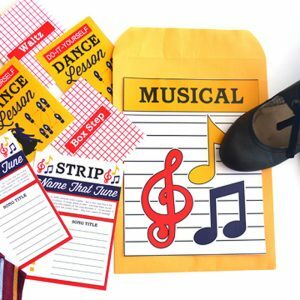 Concert Tickets – Throw caution to the wind with this purchase – he’d be stunned to find tickets to see his favorite band! Support Dad’s healthy lifestyle by providing him with all the best workout accessories and stow them in a brand new bag to make his next trip to the gym so much more exciting. Fitness Tracker – Help him meet and crush his goals with ease. Sneakers – If he has a favorite brand, go with it. If not, these will be his new favorites. Socks – Simple, but often overlooked. Good socks are essential for a good work out. The goal is to not notice them. Sweat Head Bands – Okay, headbands are quite as common for guys BUT these are an absolute necessity for sweat reduction. Water Bottle – Hydration is key during hard workouts of any kind. He’ll be glad to have this. 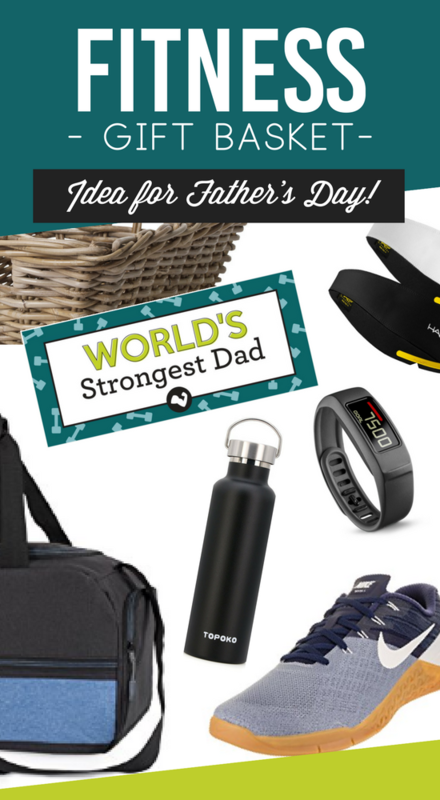 Use a Gym Bag to show off his brand new Father’s Day gifts. Alright, try to tell me you didn’t find a Father’s Day gift basket that is a completely perfect fit. There are so many to choose from and we’ve made filling them up easy-peasy too. No more excuses, gift baskets for men don’t have to be complicated anymore! Add these clever gift basket ideas to your Pinterest board now! Still didn't find the perfect gift basket? 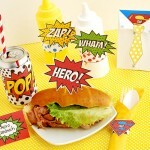 Check out the Gamer Gift Basket or the Superhero Father's Day Candy Bouquet. 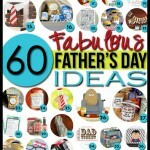 60 Father’s Day Ideas & Printables! Father’s Day is always so hard for me to prep and buy for. 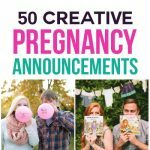 This list is great. 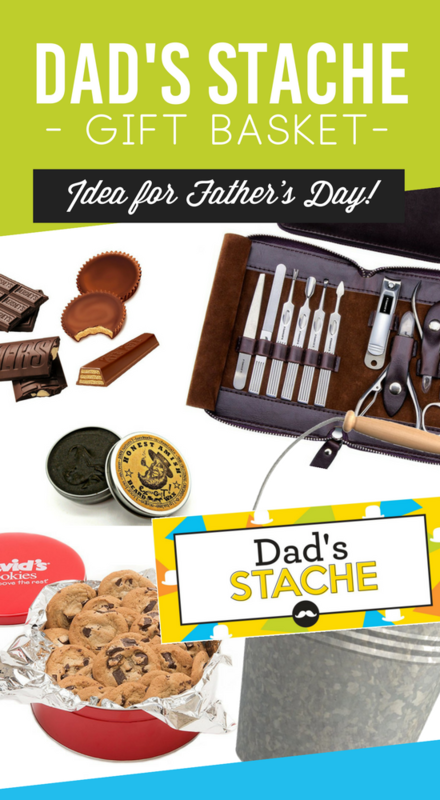 Holy moly so many awesome Father’s Day gift ideas! Thanks, Meg! 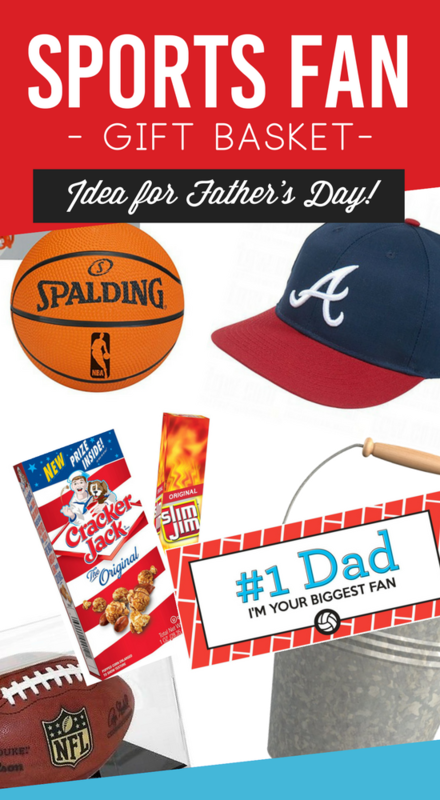 Father’s day is fast approaching and you got a good list. Thanks for these good items. I love the fitness tracker. Yes, of course! 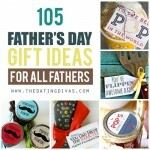 I’m always a last minute Father’s Day shopper so it’s nice to have lots of ideas in one place. 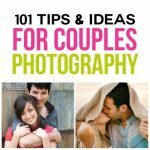 So glad you found some useful ideas… you might even be able to make them work for his birthday or Christmas, too!